Twitter suspended the Unplanned movie account “without cause” or explanation. Watch the trailer here. Users reportedly stormed Twitter with complaints, accusing the social media giant of pro-abortion bias. Twitter quickly restored the account, but did not provide reasoning for the initial deletion. Live Action Founder Lila Rose quickly came to the movie’s defense after realizing Twitter suspended the account. Due to a flood of complaints, Twitter quickly restored the account. 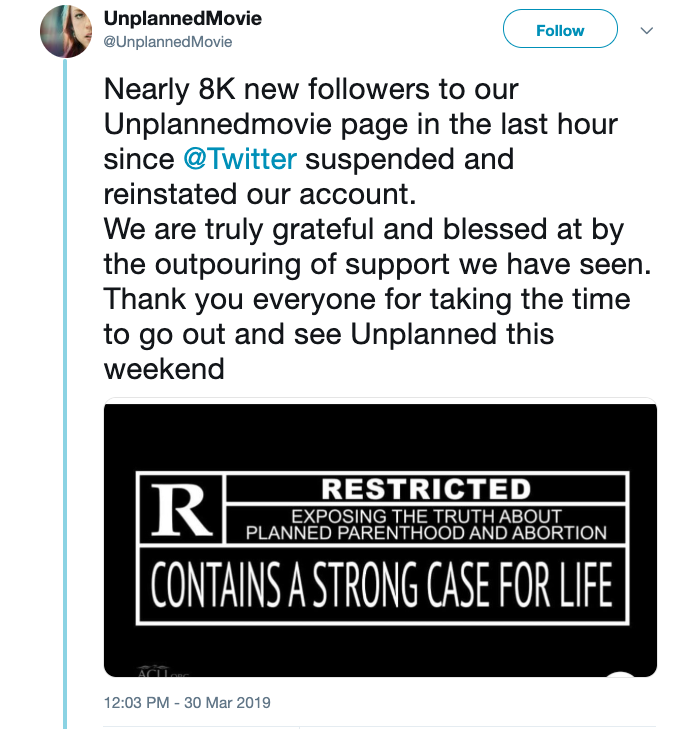 The “Unplanned” account then thanked their supporters, saying the deletion generated more than 8,000 followers within one hour! And they now have more than 54,000! Let us pray for the success of Unplanned! This article was originally published by churchpop.com. The original article can be found here. Bishop John Keenan of the Diocese of Paisley has shared a trailer of the movie. Watch it here.